You’ve likely heard about the three states of matter – gases, solids and liquids. But did you know there are actually six forms of matter? In laboratories, scientists can create plasmas, Bose-Einstein condensates and fermionic condensates, according to NASA. But, for our discussion, we’ll focus on the first three because those are the states of matter you’re likely to interact with. 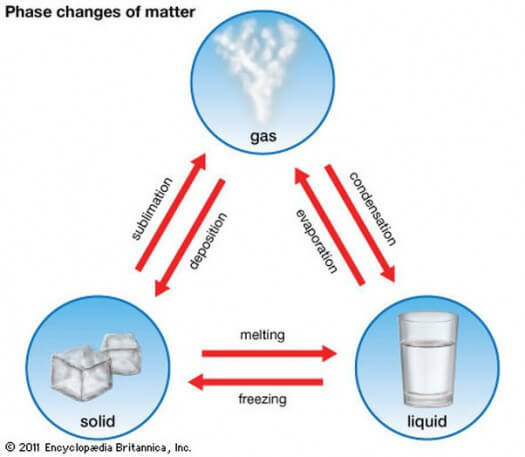 All About States of Matter: Three main states of matter are solid, liquid and gas. Liquids, like water, oil and soda, shift to fit inside the container they’re in. If you look at them under a microscope, you’ll see that they have particles that are close together, but have no rhyme or reason. The molecules move around. Gases, including air, steam and helium, are free-flowing. You can easily put your hand through them. Gases shift to fit their container and can even fill it. Their molecules are spaced far apart and wiggle and jiggle. Solids, like your desk, your backpack and your pants, are firm and stable. Their molecules are grouped together in organized patterns. The molecules might vibrate slightly, but they don’t move around. Molecules of Solid Don’t move around. Liquid Molecules are close together without rhyme and they move around. Gas molecules are spaced far apart and wiggle and jiggle. States of matter can change. For example, water – a liquid – can turn to ice, which is a solid. Heat it up and the ice becomes steam, which is a gas. A video explaining the 3 states of matter. Question: Can states of matter change from one to another? Answer: States of matter can change. For example, water – a liquid – can turn to ice, which is a solid. Heat it up and the ice becomes steam, which is a gas. 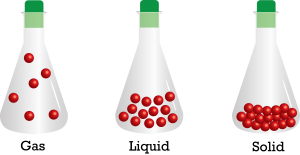 Enjoyed the Easy Science for Kids Website all about States of Matter info? Take the FREE & fun all about States of Matter quiz and download FREE States of Matter worksheet for kids. For lengthy info click here. Declan, Tobin. " Facts About States of Matter - Easy Science For Kids ." Easy Science for Kids, Apr 2019. Web. 18 Apr 2019. < https://easyscienceforkids.com/all-about-states-of-matter/ >.